LYNN Cavendish had a special present to mark her 60th birthday last month – the publication of her first novel. 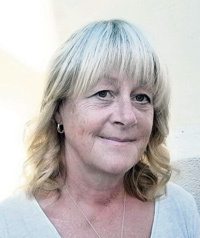 Lynn, who was born in Downend, had always wanted to write a book. She enjoyed writing when she was a child at Bromley Heath Infant and Junior Schools and at Stockwell Hill School, which later became part of Downend School. But after passing her O-levels and CSEs, she went into finance, then following the birth of her children she switched careers and began working with special needs pupils. So it was only when she took early retirement after an illness that she began writing in earnest, completing the 58,000-word comic novel, The Lights Came on for Marcia Duncan. “It had always been my ambition to write a novel and I am so pleased to have achieved it,” she said. The inspiration for Lynn’s story came out of some of the families and experiences she encountered during her 13 years supporting children from a variety of backgrounds. Her own upbringing was stable but her story centres on a young girl with learning difficulties, who lives with her alcoholic mother in a small terrace house on a rundown council estate abd becomes pregnant. The birth of her daughter turns out to be a blessing in disguise for Marcia, who develops independence and self worth, but the journey is not without its difficulties. The book is available on Amazon and at Waterstone’s at Cribbs Causeway and Lynn, who divides her time between Downend and Spain, plans to undertake some promotional events and attend some literary festivals.